No one’s going to Sue you? Johnny Cash would not agree. 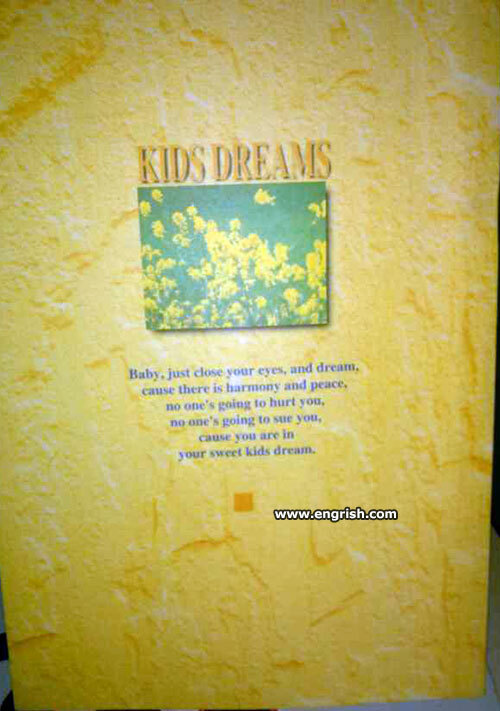 And no one’s going to put Engrish in your dreams, apparently. take my hand, we’re off to never never land. Algernon 4:16 am: Are you talking about Creepy Uncle Joe Biden? An album for photos of kids’ dreams – hey, I want one of those cameras! GOD! We’re teaching the little bastards to be litigious, when they are still babies. Doesn’t anyone else feel like chundering, when they read soppy, sentimental, sickly, crap, like this. How many people outside Australia can remember this song?